" Nichos are made of objects that can be easily purchased or scavenged in the home or community. The media are characteristically humble for a religious object, especially compared to the typically ornate icons of the Catholic Church. The shadow box itself is easily converted from a cigar box or other mass-produced wooden container, but can also be constructed from any lightweight wood, recycled tin, or glass. The colorful designs on the box and borders are created not only with paint, but also with sequins, glitter, chain, thread or rope, paper mache, and any small bric-a-brac. 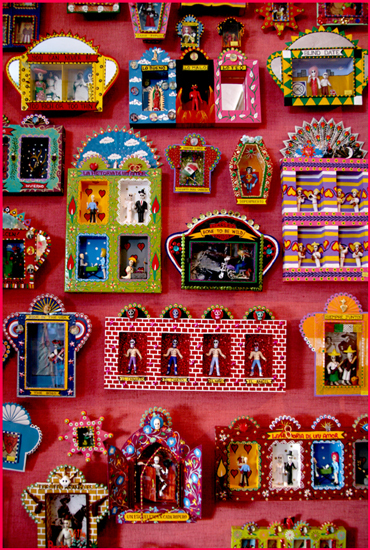 Other ornaments within nichos include milagro charms, beads, stones, nails, and other manufactured and found objects." I have long admired this folk art tradition for both its beauty (and often ohteetee kitschiness!) and also the mood of reflection and spirituality that they invoke. I have toyed with the idea of making shrines for quite sometime now and have collected a stack of things I put in a box marked "shriney stuff". Apparently, the time is not quite right for me to make my shrines but I have been playing around with some bits and pieces to create my own version of a nicho. Sort of. It is wearable and there isn't a saint present, but like a traditional nicho, it is made of some fairly common stuff , it is colourful and I have imbued it with a sense of spirituality by using a word that is close to my heart - "seek". The folk art flower that sits behind the frame has been cut from a tea tin. The heart is crafted from 2 pieces of reclaimed pewter. I think it is evocative of a traditional nicho. Certainly that was my inspiration! Last week I came across this little bag of vintage beads at a second-hand store - there are some lovely (albeit grubby!) jug beads in there and also those gorgeous red beads. I reckon the red ones might be just right for this necklace. This is an idea that I can see growing and expanding but I must say I was very happy to have made something (at last) that resembled a shrine-like object! Gorgeous! I love the Nichos idea - thanks for posting that info. What a fabulous idea. I love the use of the tea tin. Oh I love it, I can't wait to see what else you do like this. I would so wear that. I love the Nichos shown on your profile at top of page! I collect those type of dia de las muertes Nichos but haven't been back to Mexico in quite a few years so haven't been able to add to my collection! Did you make those? If not can you direct me to the source so I can purchase some? Thank you so much! Love your art as well!